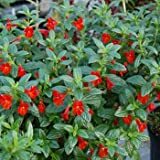 Mimulus growing herbaceous of the genus Mimulus also known as Monkeyflowers, Mimulus perennial evergreen plant, used as ornamental plant, can grow in temperate, subtropical or mediterranean climate and growing in hardiness zone 5-11a. Leaves color green in oval, linear or elliptic shape. 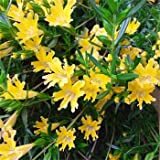 Flower color yellow, orange, red, peach, white or more than one color in mouth shape. 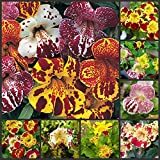 Organic Flower seeds Mimulyus Mix (Mimulus hybridus) - 1000 SEEDS.